This sterling mobius ring is made in your size and finish preference in sterling, 14k yellow rose or white gold. The simple twist ring measures approximately 3 mm wide by 1.5 mm thick and is suitable as a simple wedding band. 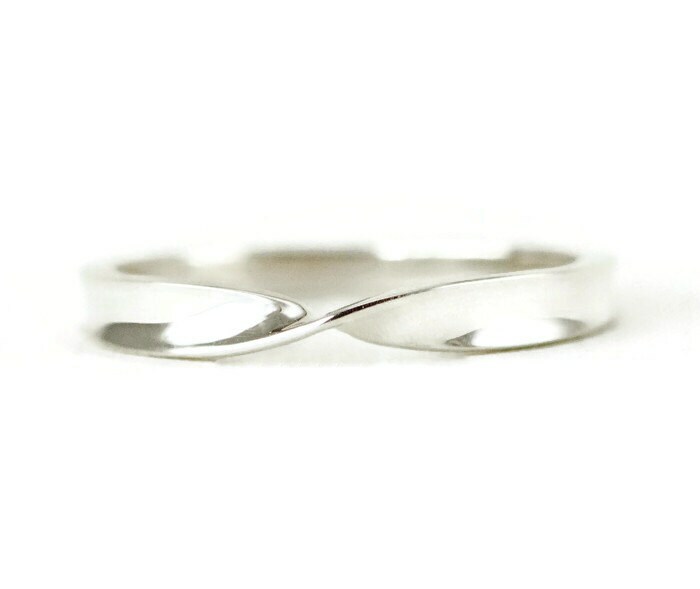 This great, well defined, mobius twist is one that can be stacked, worn alone or used as a modern wedding band. A mobius strip is a representation of infinity or eternity, because it is endless and on going. The mobius effect is a surface with only one side and only one boundary component. If you would start to 'travel' on one of the sides, you would pass around the whole ring and get back to the same point you started! - This ring inspired by the mobius effect. It has one twist, and has four surfaces, the bottom part of the ring is straight. A two-dimensional structure with only one side. This means that like a ring, which has no beginning or end, a mobius strip has no "inside" or "outside", but has only one, continuous "side". Each ring is made just for you so please allow 3-5 days (other than special requests) for me to make and send your ring. Special requests may take a little longer. All my rings are custom made to your specifications. Please read my shop policies on custom orders and ring re-sizing and asdk any questions before purchase. Your ring will ship in a ring box suitable for gift giving and includes a satin drawstring pouch for storage! I was shopping around for a mobius ring for a while now, and I’m so glad I went with this shop! I have TINY hands so this delicate ring looks perfect. It’s true to size and is so well made, I’m really impressed! Prettiest ring ever, y'all. The way it's made (with a twist that stands up a little bit from the finger) means it sparkles as well as shines. It's convinced me to get more Mobius rings just because they're so darn lovely. I love Pennee's work. She is very skilled and her jewelry is awesome. I couldn't be more pleased with my pieces. This bracelet is just amazing and I love everything about it. Thank you for all the attention to detail to create my 10th anniversary sapphire bracelet.